Welcome to Ewa Hayward Certified Translations. I am a certified Polish Translator and Interpreter. I describe myself as a vehement language enthusiast who has been perfecting my skills and aptitude in Polish translation and Polish interpreting since 2004. 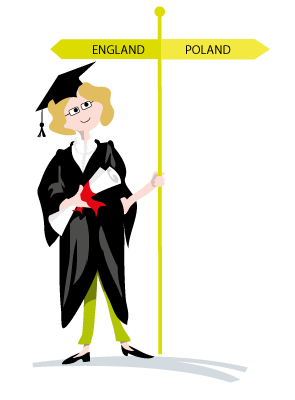 I began a career in translation after graduating from Gdańsk University, Poland with a Master’s Degree in Linguistics. I then went on to study a specialist translation course at the English Unlimited Language School in Gdańsk, Poland. I have more recently studied a Postgraduate Diploma in Translation course at the City University London, England. Then in 2014 I was awarded, after a rigorous examination, the most prestigious ratification of my abilities, the official status of Certified Legal Translator by the Polish Ministry of Justice. I have been working with clients in the UK and overseas to meet their linguistic needs since the beginning of my business in 2008 striving to facilitate communication between people who speak different languages. My experience and knowledge is supported by academic study, professional achievements and highly desirable qualifications awarded from bodies such as the Ministry of Justice in Poland. I have combined a passion for language, communication and law to amount a specialism in the area of legal translations. I can confidently say I possess an expert knowledge and skill set in translation between legal systems in Poland and English speaking countries. My legal systems skill set includes the UK, Poland, the USA, the European Union, and Australia. I can adapt my skills to other legal systems that are not listed, should you have the need. I will provide you and your clients with a professional service driven by quality with on-time delivery. I have a personal approach that is backed by my years of experience, academic achievements, and the Polish Ministry of Justice. Be confident in the quality of the correspondence, documentation, contracts you and your clients are sending and receiving; contact Ewa Hayward today so that I can provide you with more information. 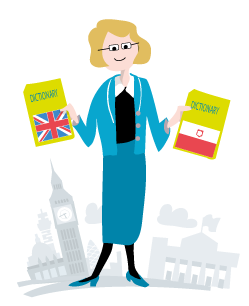 2014: Sworn Legal Translator certified by the Ministry of Justice Poland; Licence Number TP/67/14 – prestigious title awarded to those who show the highest level of linguistic and legal competency between Polish and English. 2010: Translation courses at the City University of London and a community interpreting course. 2006: Master of Arts in the field of linguistics awarded by the renowned University of Gdańsk where I perfected my bilingual skills and deepened my knowledge of English speaking countries. 2004: Bachelor of Arts in the field of English Studies awarded by a Teacher’s Training College in Poland which qualified me to teach English to all ages at all levels. The qualification is recognised in the UK and I hold a Qualified Teacher Status as well. What is the primary reason behind translating? The primary role of any type of translation is to "bridge two cultures separated by language barriers, to see how these barriers are crossed and how communication can be established between the sender of the message embodied in the text and its recipients" *. The two cultures are equipped with laws, legal terminology, concepts of their own and codes to national law making. However, the need to cooperate, the very existence of international trade, business, the integration of economic, political and social spheres calls for constant translation. Be confident in the quality of the correspondence, documentation, contracts you and your clients are send and receiving; contact Ewa Hayward today so that I can provide you with more information.